This space weather is due to the March 7 activity from the sun that caused rapid changes to the shape of Earth's magnetosphere – the bubble of protective magnetic fields surrounding the planet -- resulting in a geomagnetic storm. As of March 8, the storm was fairly mild since the magnetic fields from the CMEs were partially aligned with Earth's own and thus slid around the magnetosphere. However, the geomagnetic storm has increased because the magnetic fields of the CMEs have now changed direction such that they can more easily deposit magnetic energy and radiation into Earth's environment. The leading edge of the March 6 coronal mass ejection (CME), reached NASA's Advanced Composition Explorer (ACE) satellite at 5:42 AM EST. ACE sits just outside of Earth's magnetic environment, the magnetosphere. As magnetic fields from the CMEs connected up to the magnetosphere, instruments on Earth began to measure changes in our planet's magnetic fields – indicating the onset of a geomagnetic storm. At the time of writing this was still a minor storm, rated a G1 on a scale of G1 to G5. There will be updates as needed if the rating increases. NASA models using data from the Solar Terrestrial Relations Observatory (STEREO) and the Solar Heliospheric Observatory (SOHO) have now provided more information about the two CMEs associated with the two March 6 flares. The first is traveling faster than 1300 miles per second; the second more than 1100 miles per second. NASA's models predict that the CMEs will impact both Earth and Mars, as well as pass by several NASA spacecraft – Messenger, Spitzer, and STEREO-B. The models also predict that the leading edge of the first CME will reach Earth at about 1:25 AM EST on the morning of March 8 (plus or minus 7 hours). Such a CME could result in a severe geomagnetic storm, causing aurora at low latitudes, with possible disruption to high frequency radio communication, global positioning systems (GPS), and power grids. 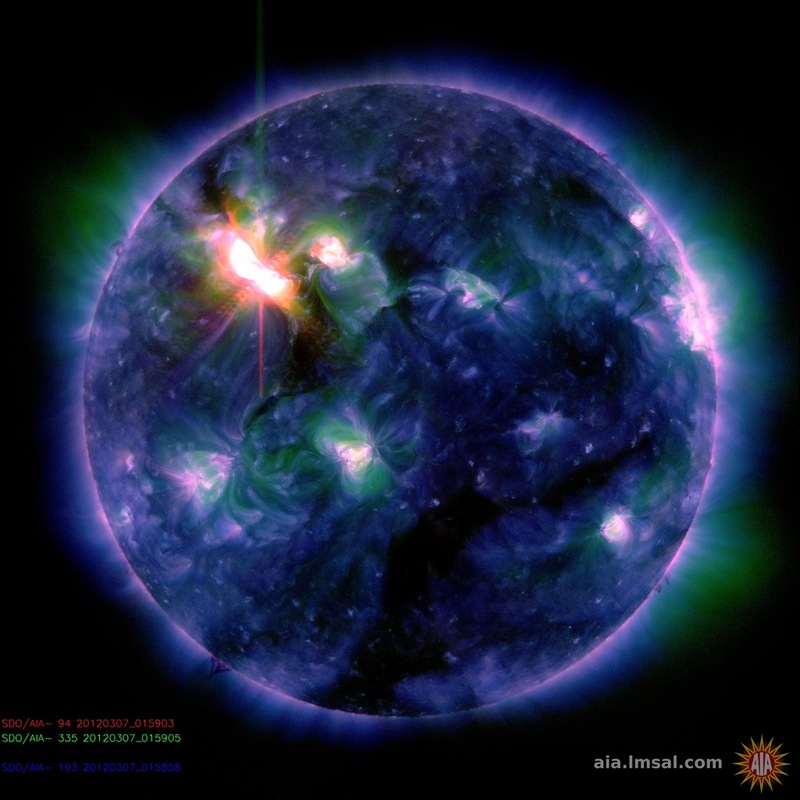 The sun erupted with one of the largest solar flares of this solar cycle on March 6, 2012 at 7PM EST. This flare was categorized as an X5.4, making it the second largest flare -- after an X6.9 on August 9, 2011 -- since the sun’s activity segued into a period of relatively low activity called solar minimum in early 2007. The current increase in the number of X-class flares is part of the sun’s normal 11-year solar cycle, during which activity on the sun ramps up to solar maximum, which is expected to peak in late 2013. About an hour later, at 8:14 PM ET, March 6, the same region let loose an X1.3 class flare. An X1 is 5 times smaller than an X5 flare. These X-class flares erupted from an active region named AR 1429 that rotated into view on March 2. Prior to this, the region had already produced numerous M-class and one X-class flare. The region continues to rotate across the front of the sun, so the March 6 flare was more Earthward facing than the previous ones. It triggered a temporary radio blackout on the sunlit side of Earth that interfered with radio navigation and short wave radio. In association with these flares, the sun also expelled two significant coronal mass ejections (CMEs), which are travelling faster than 600 miles a second and may arrive at Earth in the next few days. In the meantime, the CME associated with the X-class flare from March 4 has dumped solar particles and magnetic fields into Earth’s atmosphere and distorted Earth's magnetic fields, causing a moderate geomagnetic storm, rated a G2 on a scale from G1 to G5. Such storms happen when the magnetic fields around Earth rapidly change strength and shape. A moderate storm usually causes aurora and may interfere with high frequency radio transmission near the poles. This storm is already dwindling, but the Earth may experience another enhancement if the most recent CMEs are directed toward and impact Earth. In addition, last night’s flares have sent solar particles into Earth’s atmosphere, producing a moderate solar energetic particle event, also called a solar radiation storm. These particles have been detected by NASA’s SOHO and STEREO spacecraft, and NOAA’s GOES spacecraft. At the time of writing, this storm is rated an S3 on a scale that goes up to S5. Such storms can interfere with high frequency radio communication. 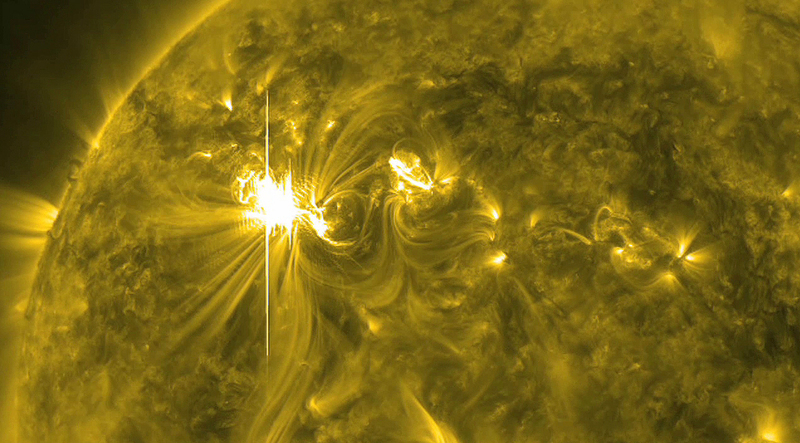 Besides the August 2011 X-class flare, the last time the sun sent out flares of this magnitude was in 2006. There was an X6.5 on December 6, 2006 and an X9.0 on December 5, 2006. Like the most recent events, those two flares erupted from the same region on the sun, which is a common occurrence. The Solar Heliospheric Observatory (SOHO) captured this movie of the sun's coronal mass ejection (CME) on the evening of March 6, 2012. The extremely fast and energetic solar particles associated with the solar flare caused the "noise" at the end of the movie.